Would you like to join this good-looking group as a volunteer? 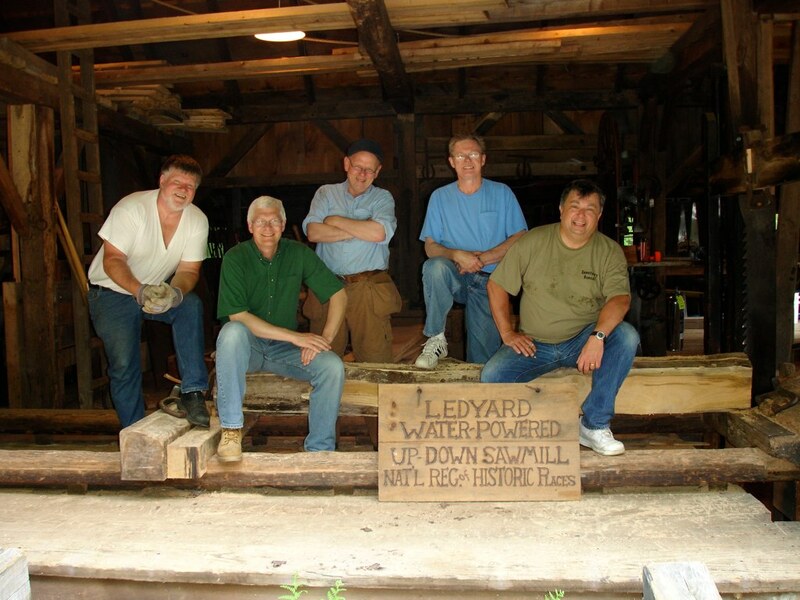 The Ledyard Up-down Sawmill is owned by the town of Ledyard, but is operated solely by volunteers. Like the mill itself, this volunteer opportunity is unique - you will have the chance to operate and teach others about historic New England using the only surviving operating sash sawmill in the United States which remains on its original site and is accessible to the public. We would love to welcome you as a regular or occasional volunteer participant. We welcome those interested in historic buildings and technology, wood and wood products, blacksmithing, greeting and guiding mill visitors, or who can help with web design, social media and publicizing the sawmill. We would be pleased to teach you about the mill and sawmill technology to help you interact with visitors effectively. It is critical for volunteer groups to grow by welcoming new volunteers who have new points of view, ideas, and skills. If you are interested, stop by the mill when we are open or send an email to info@ledyardsawmill.org. The mill is a monument to the volunteers who worked many hours to restore it to operating condition. Much of the sawmill building and machinery were restored under the direction of Wendell Comrie who, operated the mill and assisted on the saw after the restoration. Thomas Tefft, chairman of the blacksmith shop committee, also was assistant sawmill operator when the mill first reopened. Capt. Al Sears, The Mark Twain of Ledyard, branded souvenir shingles cut on the Lane shingle mill. Other members of the Sawmill Committee assisted with the running of the mill museum. John Purdy was liaison from the Ledyard Jaycees, a group that acted in partnership with the Sawmill Committee to operate the mill. In 2002, a plaque commemorating the contributions of Wendell Comrie was mounted inside the mill.